Week 3: Running, Old/New Friends and What Now!?! As I’m sure you are aware….my running week restarts every Monday. Some days I have to fight with my inner self to get up and just go, but other days not so much. The first week of Christmas break was awesome…I stayed in North Augusta, SC and was able to link up with my sole sistahs of BGR! Augusta (click here for a recap of last week). Here it was the last week of break, and I was struggling to get up to go out for an early morning run (looking forward to going back to work and getting life back on track (did I just say that LOL)). It’s never hard for me to get up to run with someone else but week 3 was a challenge for me. I was back home and the weather sucked the first couple of days during the week and as you are quite aware…nothing ever goes as planned…. Well, I planned to head out at 5:00 am on Monday to meet up with BGR! Columbia but of course it was raining. So that run was canceled. No big deal, there were more hours left in the day for me to go for a run 🙂 . 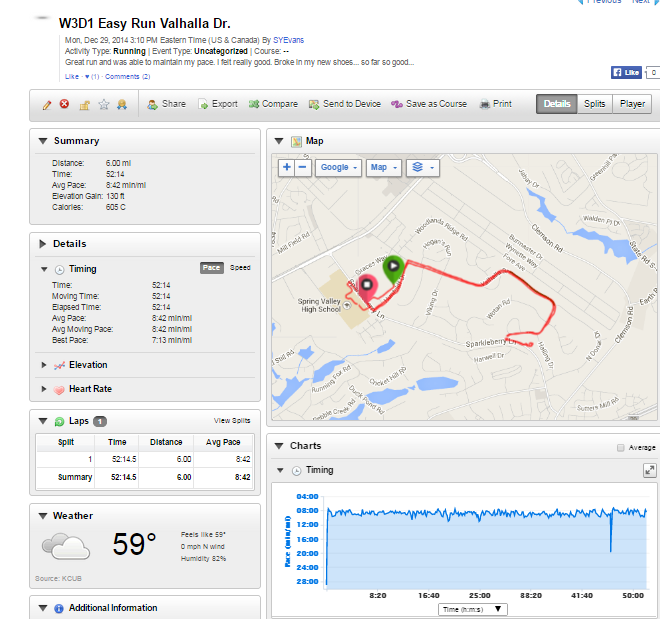 Since I was still out of work I decided to run later that afternoon. I got started around three o’clock and just kept it close to home. The route was perfect for a run. There was hardly any traffic and it was a nice out and back route with a couple of hills thrown in. 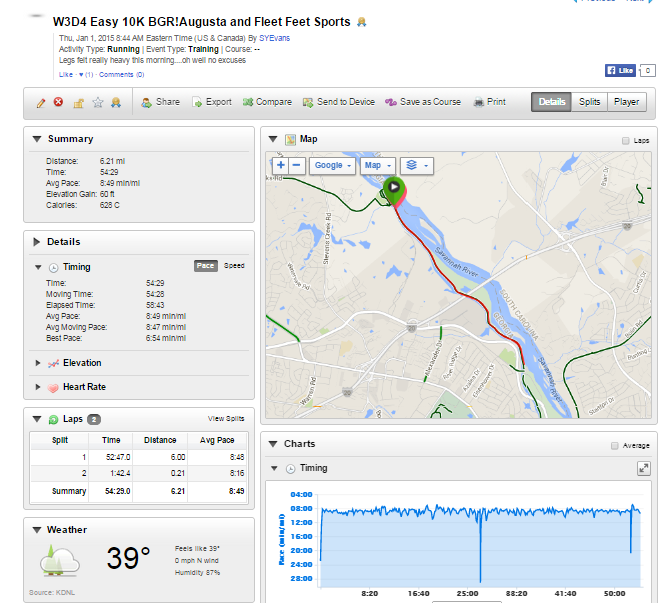 That run was just an easy six miles at my conversation pace (8’45). I pretty much have that pace down. Tuesday, I planned on meeting BGR! Columbia at the Bi-Lo of Sandhills at 5 am. 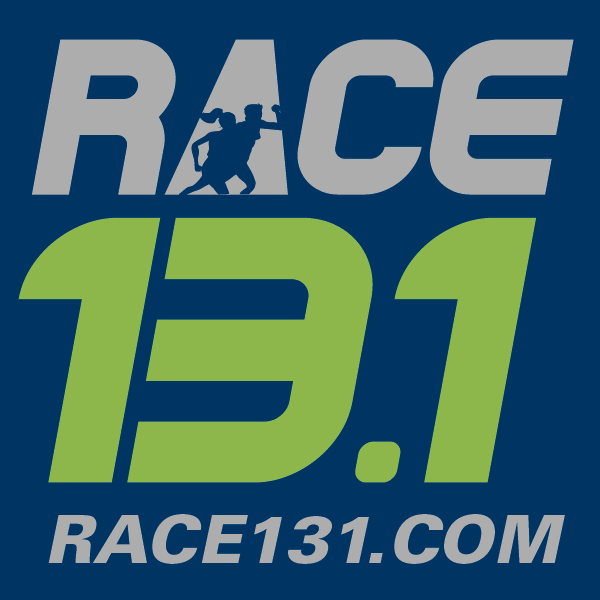 I didn’t want to get up that early especially after just going to bed at 1145 (late night…read about it below in non-running news 🙂 ) the night before. Well what do you know…it’s raining…AGAIN. This weather…one minute it’s nice out, the next it’s cold as heck (this is how folks get sick). Needless to say, the run was canceled. And yes, I know (we all should by now 🙂 ), that I run in the rain….but man my bed was really calling my name. It would have made better sense for me to just go out and get my run over with. But I was tired…so I got undressed and went back to bed. Figured I would just run later in the day since my day was pretty much opened. I headed out around 6 pm (yeah that was pretty late for me but I knew I wouldn’t be out too long and I was going the same route as yesterday) to get in 4.5 miles. That run consisted of repeats, which started with a one mile warm-up at my CP (8’45) followed by ten repeats of one minute at 8’15 and one minute at 8’45. Once again my pace was all over the place (still a work in progress). I felt great during the entire run…I may have started feeling the repeats around the 8th one but it wasn’t bad (and I was running uphill). 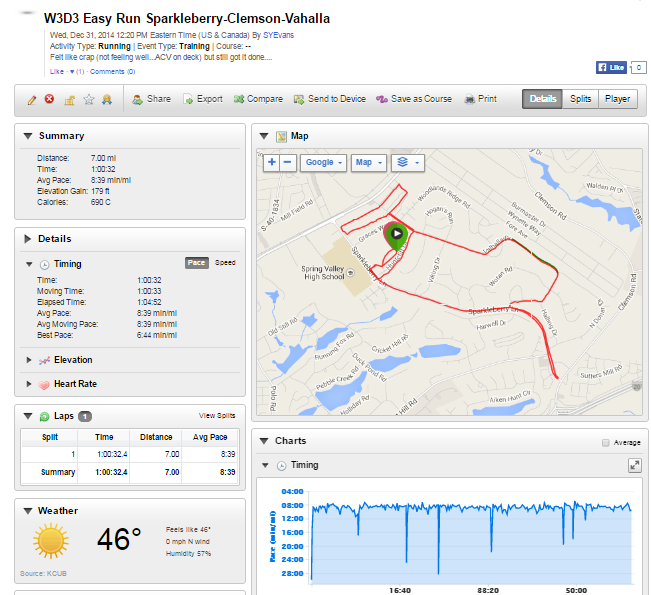 Finished this run with a one mile cool down at my CP (8’45). I woke up not feeling well on Wednesday so I decided to go run later that day (I’m really going to miss being off work). 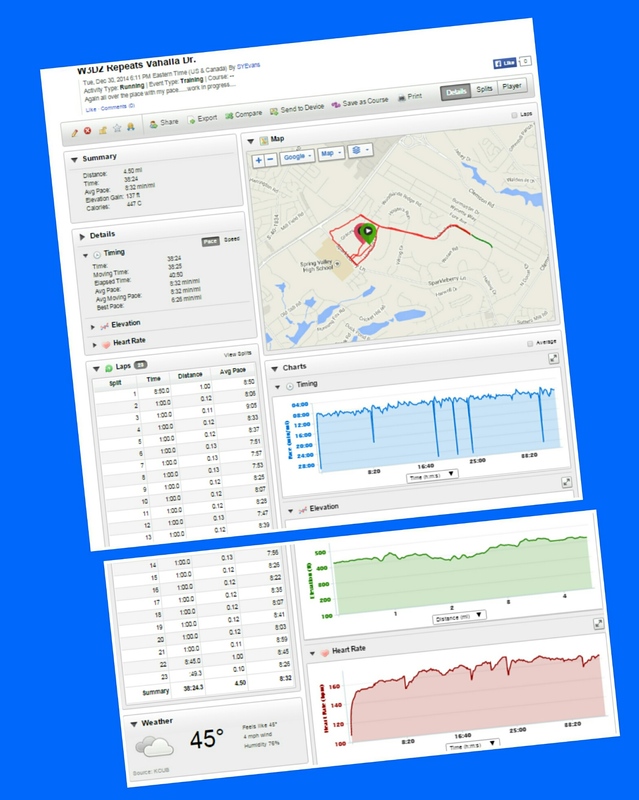 I headed out about 1215 for an easy 7 mile run at my CP (8’45). The run was perfect even though I felt like crap. 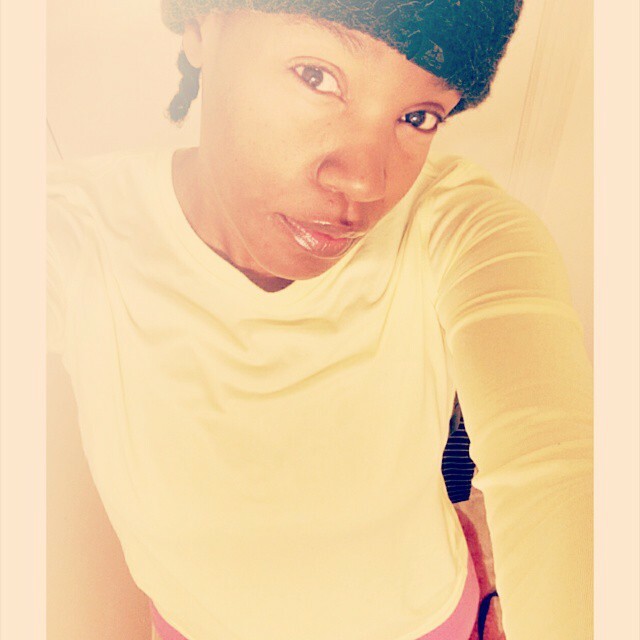 I ran straight down/up (massive hill almost stopped me in my tracks) Sparkleberry Lane, which was a bucket list item…so really I was WINNING and in a zone….I was feeling myself 🙂 (in my Beyonce voice)!!! On New Years Eve, I headed back down to North Augusta, SC, so I knew I would hook up with my BGR! 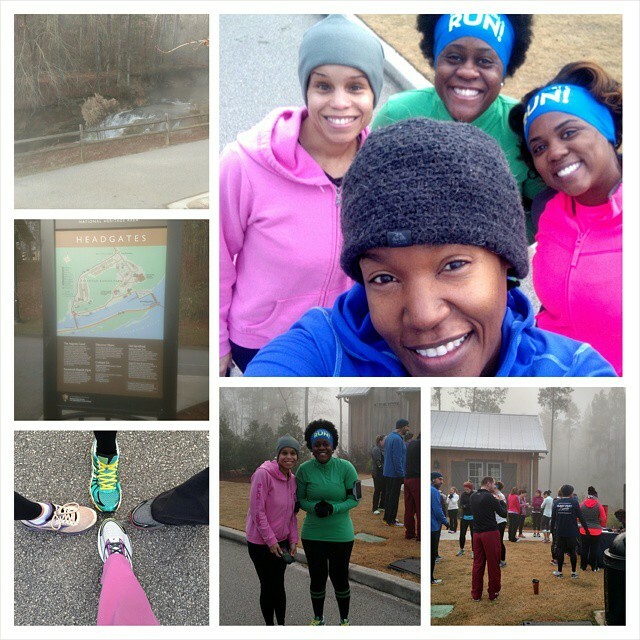 Augusta Grovetown crew to bring in the new year pounding pavement with my sole sistahs. Woke up New Year’s Day feeling fresh to death (I guess turning in on New Year’s Eve around 10 pm would do that to ya) 🙂 . Fleet Feet Sports of Augusta, GA hosted their first ever Fun 60 minute Resolution Challenge. Folks came out to see how far they could run/walk in 60 minutes. So I met BGR! Augusta at the Savannah Rapids Canal Trailhead near the beautiful waterfalls (no shade). 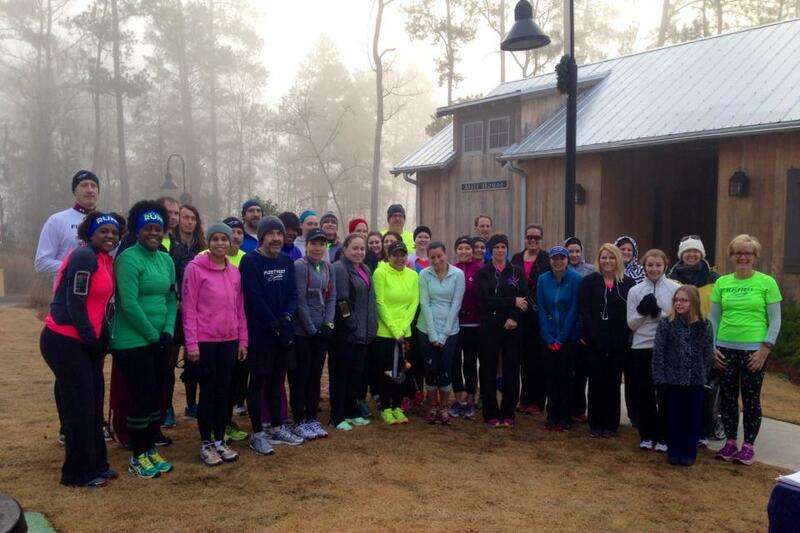 This was an awesome run to start the new year with my crew from Grovetown (and Amber). 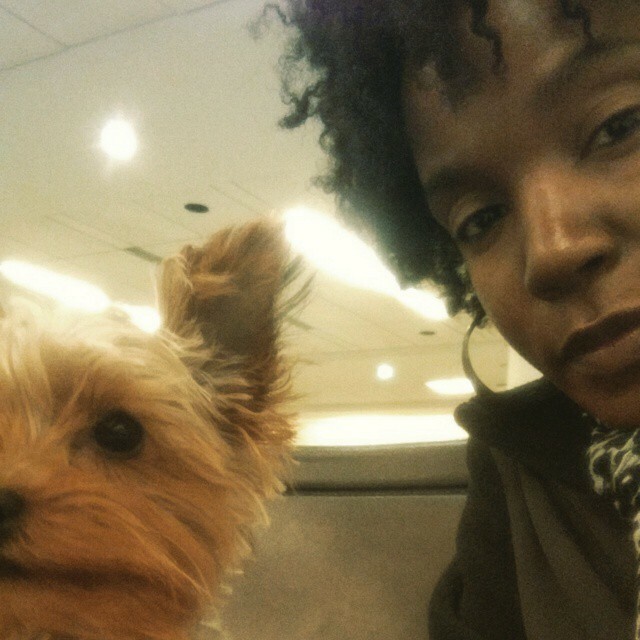 Amber is the run coordinator for BGR! Augusta. My training plan called for doing one mile warm-up at my CP (8’45) with 8X400 meter (1/2 mile) runs at my 5k pace (7’45) with a two minute static rest in between, followed with a one mile cool down at my CP. Well I figured I wasn’t going to be finished in the allotted amount of time given for the Resolution run, so I just decided to run a 10K instead. It’s a good thing I did, my legs felt really heavy. I’m not sure I would have been able to run at my 5K pace. I wasn’t able to get my long run in on Saturday because Cooper and I headed out of town to pick up my man child from the airport. He had spent Christmas break in Maryland with his dad. So glad that he’s back home!!! I almost ran on Sunday but decided againist it since it was my rest day 🙂 . Oh well I’m sure I will make up for it in week 4. All in all this was another great week for running (I have been on a roll…fingers crossed it stays that way 😉 ). I really love this time of the year…being out of work for two weeks straight will have you feeling all kinds of happy. I really enjoyed hanging with my family and friends over the last two weeks. I hope you all enjoyed your holidays as well. Wishing you all a Happy Happy New Year!!! I’m really looking forward to improving my pace and throwing around more weight in 2015. I also want to get my son back into running this year (bought him some new sneakers…so fingers are crossed). What are you looking forward to in 2015? Set any new running goals? Monday night we had tickets to see Kevin Hart on his What Now tour. Best show hands down. He was hilarious. I really enjoyed the show and we had really good seats (just hate I didn’t have my glasses… I really couldn’t see his facial expressions…’no glasses…REALLY!!!’). If you haven’t seen Kevin Hart in action…I recommend doing so. He was FANTASTIC!!! After the show, we met up with one of my old childhood friends from my hometown at Wet Willies (can you say frozen daiquiris). I knew she was going to be in town for the show, so I asked if she and her wife would like to meet up for drinks afterwards. Now it had been years since I last seen Mika (probably my early military days) but it felt just like yesterday. 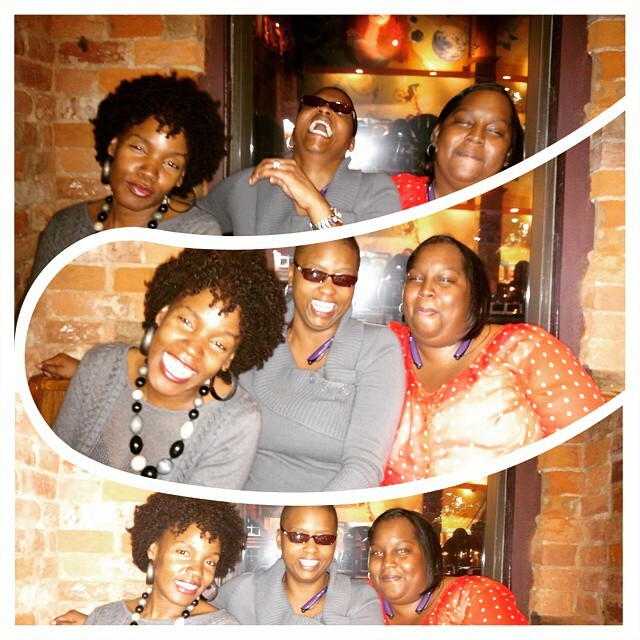 We laughed, ate and sipped sizzurp …just an amazing time with old and new friends. Her wife is a hoot!!! Looking forward to hanging out with them again…soon!!! Next Article Week 4 Pains, Gains, Detox and Chocolate Bites!!! Great week and great pictures! That resolution challenge sounds like so much fun! And I think you definitely did the smart thing turning in early on NYE. One of my resolutions is MORE SLEEP. Happy New Year to YOU! Thanks!!! Cheers to you getting more sleep in 2015!!!! Nothing beats running and spending time with good friends!! Well, maybe a solid meal haha. I LOVE running when I have no other obligations like work or school.